Matthew and I have many, many million dollar ideas and we are sharing them with you today. Go, make them happen. Don’t forget us when you make your first $5. 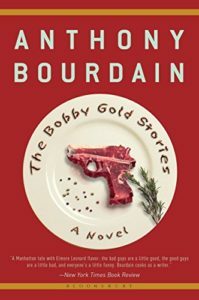 We break down The Bobby Gold (Stein) Stories where ample drug, cop, prison and kitchen references mark it firmly in classic Bourdain territory. Matthew talks about his time in the hoosegow —big house or slammer, if you prefer — because he’s a bad, bad, man. P.S. We were so wrong about what the drug ‘hydro’ is. it’s hydrocodone, not hydroponic weed or heirloom tomatoes. This entry was posted in Uncategorized on July 25, 2016 by Becky Selengut.